Half a century after his death in a North Vietnamese prison camp following horrific injuries, unimaginable hardship, and unspeakable torture, United States Air Force Captain Lance P. Sijan’s name and heroics are still as remarkable and important as they were in 1968. For those who knew the Milwaukee native and Medal of Honor recipient during his brief-but-brilliant life, the love and legacy he left behind are just as special as his bravery in battle. Thanks to the tireless efforts of his little sister, Lance’s life, his accomplishments, his courage, his resilience, and his message all live on to inform and inspire future generations—both in Milwaukee and throughout the world. 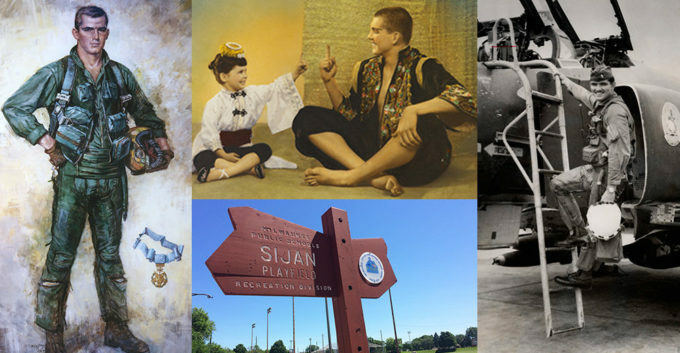 Janine Sijan Rozina has been present at many dedication ceremonies and has been the honorary recipient of many of her sibling’s awards and accolades through the years. Around 10 years ago, she decided to “become very proactive in maintaining his legacy.” Since then, Sijan Rozina has been working on a documentary about Lance. Sijan has been in production for six years. On Tuesday, the documentary about the local hero will have its world premiere at Oriental Theatre, as part of the Milwaukee Film Festival. Click here to read the full story at Milwaukee Record.